For this month’s culinary expedition through Henderson, we’ll be highlighting some delicious, warm-you-to-your-bones soups. I’m featuring five local eateries who have it going on in the soup department, because when the weather outside is frightful, a warm bowl of soup is just so delightful! 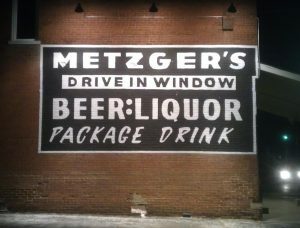 The second location I stopped into was Metzger’s Tavern. Not just a burger joint, Metzger’s also has a couple of different tasty soups, and today I will be calling attention to their chili. Metzger’s chili is a welcomed take on old school Germen culinary techniques, like adding noodles to make the dish stretch and fill your stomach. 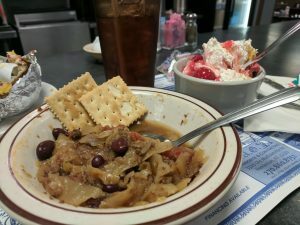 This chili has the right mixture of spices, ground beef, beans, and spaghetti noodles and is served with a side car of oyster crackers. This chili is perfect for the working man to enjoy on a lunch break or a cold traveler exploring all that Henderson has to offer. 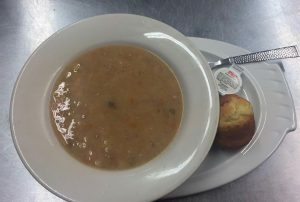 Do yourself a favor and head to Rockhouse at Wolf’s, “where friends meet since 1878,” and get a bowl of classic bean soup. Our journey continues with Rockhouse at Wolf’s, perched on the corner of First and Green. This soup is a seasonal specialty for Rockhouse at Wolf’s, only available from October to March, which is the perfect time of the year for hot, full of flavor bean soup. This soup is served with a side of house-made muffin cornbread and butter— no crackers needed. This is not your average canned soup. With every bite, you can taste the mirepoix of onions, carrots, and celery, and let’s not forget the star of the show, the beans. Rockhouse at Wolf’s is favorite among locals, and if you’re extending your weekend stay in Henderson, be sure to grab a table for pub trivia on Mondays at 7 p.m.! 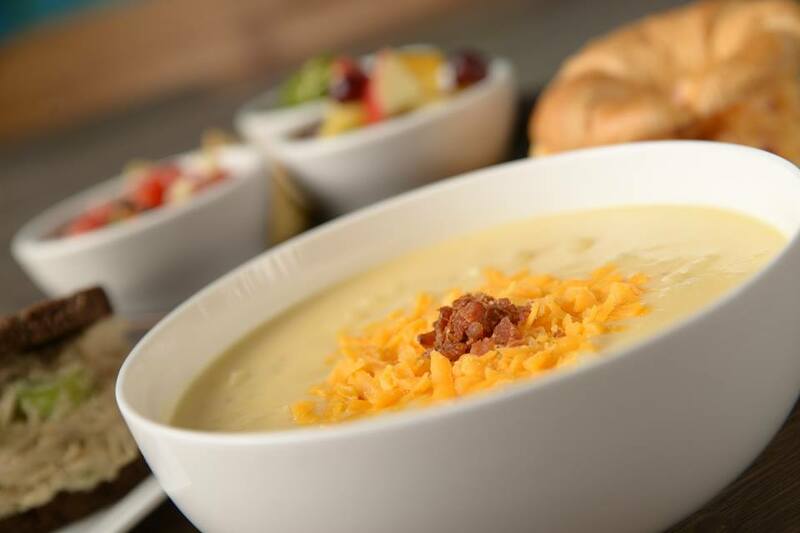 If you are looking for nostalgia, head on down to the Sidewalk Café and grab yourself a bowl of cheeseburger soup. Sidewalk Café offers an array of different lunch items like salads and soups. 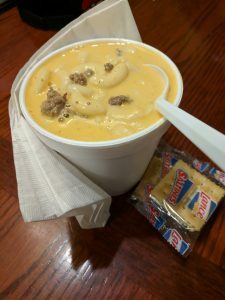 This month, I tried their cheeseburger soup, normally sold as a special on Tuesdays. This soup is cheesy and thick with loads of fresh ground beef, and they sure don’t skimp on the meat. With a creamy cheesy texture, you just can’t go wrong. This soup reminds me of some cheeseburger mac from my childhood, but with a grown-up twist. Eastgate Family Restaurant has been a family owned business in Henderson for years, situated in the Eastgate Shopping Center on 2nd Street. As soon as you walk through the door, you’re greeted with a warm smile and Southern hospitality. This month, I’m calling attention to the cabbage and beef soup. Everyone is always raving about this hardy bowl of homemade soup loaded with large diced tomatoes and fresh green peppers, kidney beans, chunks of beef and the star ingredient, the large pieces of perfectly blanched cabbage. Your experience at Eastgate Family Restaurant will be a friendly reminder of how small, Southern towns welcome travelers—and with its close proximity to Interstate 69, it’s the perfect pit stop before you hit the road. 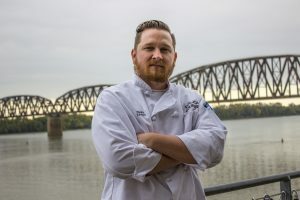 Click Here To See Chef Zach’s Top 5 Burger Picks!